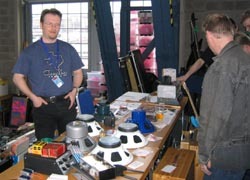 Report from Gothenburg Guitar Show, Sweden 26-27th of April. 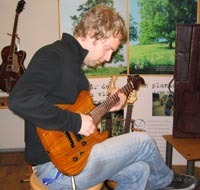 UGG attended the annual Gothenburg guitar show that is held the last Weekend of April. 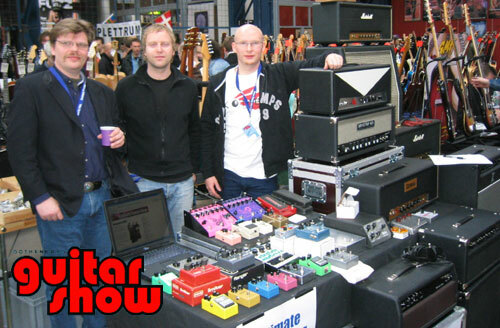 The show attracts gear freaks and traders from all over The Nordics, here is some of our personal highlights. First off UGG displayed some cool gear at a table in the middle of the Ground floor, sadly this was a silent show so where not allowed to let people enjoy the greatness of Komet, Germino, Mystique amps, Skrydstrup and a big array of stomp boxes. I suspect that some where not so sad since these amp can be quite loud, and even a Komet CAN get tiresome if you are trying to talk about G&L guitars with a customer 8 feet from the speaker cab. There where a at least some degree of interest in our idea and we had some great discussions with other tone hounds during the weekend. Some highlights where Dennis GIGANTIC pedal collection 600 stomp boxes the worlds largest known collection. ARES with Guitars mostly built with Nordic woods, the one we tried where a Zebrawood bodied guitar with mahogany neck, it had a very percussive and personal sound. Vintage Vibe displayed some custom built amps, including Vibroclone, a Blues SR which basically is a almost standard Blues-JR in a hand built 3*10 enclosure. It really sounded like a completely different amp. Custom Sounds of Finland where there, of course, displaying BJF Pedals and the Mad Professor amp. 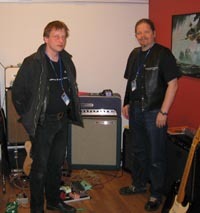 The Mad Professor himself, Björn Juhl (Swedish), happily showed new BJF pedals through the Mad Professor amp. This is a very good and quite unique amp which we hope to do a complete review of soon. There where some new BJF designs as well, a TS inspired OD and a quite nice little green booster that was a really special little pedal. Custom Sounds also displayed Tone Tubby speakers.